The Apple Kingdom is the fourth kingdom in Donkey Kong Jungle Beat. In the original version of the game, it is fourth kingdom linked to the D Barrel and can be accessed by collecting three or more Crests. In the New Play Control! version, it is the first kingdom linked to the K Barrel and is accessed by completing the Watermelon Kingdom. Apple Kingdom is the dominion of Turret Tusk, who is also fought as its boss. Donkey Kong eats through a giant Apple at the end of every level in the kingdom. Massive Canyon is the first area of the Apple Kingdom. The level takes place in a deep, dark canyon. Donkey Kong uses his Wall Jump ability to reach inaccessible areas. He also uses Banandelions to fire himself to different areas. Helper Monkeys aid Donkey Kong throughout this stage as well, throwing him to the end of the level. Many uncommon objects return in this level, such as mushrooms that grow when a sound wave is sent at them. 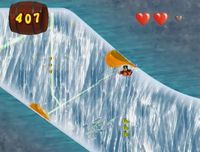 Before completing the level, Donkey Kong also fights a Gōrumondo impeding his progress. Ice Warren is the second area of the Apple Kingdom. This level takes place in a frozen cavern. Ice Bakkies attack Donkey Kong here, but they can be dispatched with his clap attack. Many Helper Monkeys assist Donkey Kong to progress and get to inaccessible areas, as they do in many other levels. Throughout much of the level, though, the ape slides down slippery surfaces and collects the many Banana Bunches that fill the level. 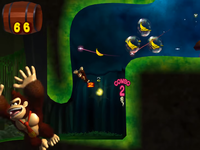 At the end of the level, Hoofer helps Donkey Kong jump over large gaps in a bonus game. Each jump nets Donkey Kong ten bonus beats. Turret Tusk must then be faced, in a plain-like setting. Turret Tusk is a mechanized elephant colored with brown camouflage. Turret Tusk attacks by launching cannonballs out of its tusk at DK. The way to defeat him is by throwing Blood Pines at it, but it is more effective if thrown in its trunk. A heart then comes out of the elephant, at which Blood Pines can then be thrown. When half its health is gone, Turret Tusk begins attacking by firing three cannon balls consecutively. As damage increases, Turret Tusk begins to smoke and blacken, and when it reaches zero health, it deactivates.